The Pyramid Society’s All American Straight Egyptian Challenge Cup Member Awards Program is held in conjunction with existing two and three year old breeding in-hand classes held at designated open competitions throughout the United States. Winning horses that meet the program’s qualifications will receive the Challenge Cup awards, and will then be eligible to advance to the Challenge Cup Championships at the Egyptian Event in Lexington, Kentucky. Although the preliminary classes are open to all Straight Egyptian two and three year old horses, these special member awards will be awarded to qualifying Pyramid Society member owned horses. There will be no additional entry fee for enrollment in this program. Contact: Taryl O’Shea, Ph: (480) 515-1500. info@scottsdaleshow.com. Contact: Cricket Gates, Club Treasurer. 2. Horses eligible for The Pyramid Society All American Straight Egyptian Challenge Cup Member Award Program must be bred by a North American breeder with a North American address (US, Canada, Mexico) as recorded on the AHA registration certificate. 3. 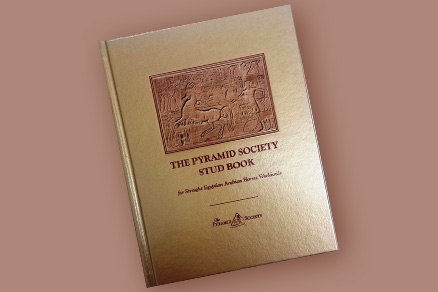 Pyramid Society membership is a requirement of eligibility for receipt of Member Awards in the All American Straight Egyptian Challenge Cup Member Awards Program. A.Supporting membership acceptable for local, Regional/Class A shows, East Coast Championships. B.Premium membership is required for participation in the All American Straight Egyptian Challenge Cup Championships held at The Egyptian Event in Lexington, KY.
4. A Straight Egyptian Certificate will be sent to horses who qualify for eligibility in the All American Straight Egyptian Challenge Cup Championships in Lexington, Kentucky. 5. Horses competing in the All American Straight Egyptian Challenge Cup Championships will be judged using the comparative system and according to The Pyramid Society Standard of Excellence. 6. The Pyramid Society Humane Standup rules shall be used and enforced in All American Straight Egyptian Challenge Cup Championships, and strongly encouraged at all qualifying shows. 7. The USEF rules concerning balding/excessive grease/grooming will be enforced at the All American Challenge Cup Championships. 8. In the All American Straight Egyptian Challenge Cup Championships, emphasis will be on a Humane Standup and Natural Grooming, in accordance with The Pyramid Society’s policy to showcase horses in a manner which lets their natural beauty, intelligence and charisma take center stage. 9. For 2019 ANY entry that is shown and judged in approved qualifying classes, and meeting all eligibility requirements as stipulated herein, will be eligible to compete at the All American Straight Egyptian Challenge Cup Championships in Lexington, KY. For a current list of approved qualifying classes at Local/Regional/Class A shows please contact The Pyramid Society at info@pyramidsociety.org. 12. The All American Straight Egyptian Challenge Cup Championships will be judged comparatively and award a Champion, Reserve Champion and Top Ten sashes. Prize money will be awarded to the Top 5 winners. *The All American Straight Egyptian Challenge Cup Championships at the Egyptian Event are for qualified two and three year old colts and fillies. While the majority of qualifying shows will be held during the same year as the championships, if a qualifying show, such as the Arabian National Breeders finals, is held after that year’s Challenge Cup Championships, but before the next calendar year, the qualifying classes at that show will be for one and two-year old colts and fillies. Those qualifiers will then be two and three years old during the calendar year of the championships for which they are eligible to compete. All confirmed entries in a preliminary show’s qualifying classes meeting eligibility requirements as outlined above will be considered officially entered in the Challenge Cup Program. Sponsorships are available at a variety of levels providing wide-spread visibility throughout the year.